Beautifully engraved certificate from the Berkshire Railroad Company unissued in 1906. 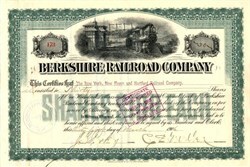 This historic document was printed by American Bank Note Company and has an ornate border around it with a vignette of a train going under a bridge. This item is hand signed by the Company's President, C. D. Muller and Secretary, J. G. Parker and is over 100 years old. Incorporated in 1837; organized in 1838; consolidated with Stockbridge and Pittsfield Railroad Company and the West Stockbridge Railroad Corp. in 1905 but kept its name. Deeded in 1910 to The New York, New Haven and Hartford Railroad Company.